Just because you’re away from home doesn’t mean you shouldn’t have delicious, quality meals. 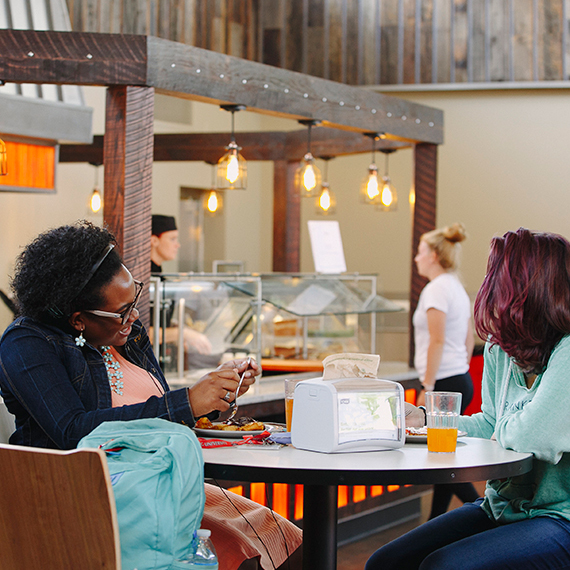 Heidelberg’s goal is to provide the best possible dining experiences, serving up nutritious food with lots of variety so you can find what you need to stay healthy. You’ll have the chance to try new things, but you’ll also be able to order up a good old-fashioned sandwich or slice of pizza. Heidelberg's dining hall is open seven days a week for all-you-care-to-eat meals. Whether you like comfort food or nontraditional tastes, your dining experience is one way Heidelberg feels more like home. With Parkhurst Dining at Heidelberg, you'll enjoy fresh, made-from-scratch food and menus that focus on seasonal items and provide continuous selections that change throughout the day. Eat healthy your way, with your choice of a wide variety of delicious and healthy meals, featuring local and sustainable food sources, build-your-own meal concepts and special options for every diet, including vegan, vegetarian and gluten-free. Throughout the year, there are specialty dinners including Oktoberfest meal, the international dinner, and everyone’s favorite Late Night Breakfast. Our focus is on craftsmanship, and we choose imperfect over standardized food. Our chefs take production into their own hands – chopping, dicing, peeling and cooking from scratch with real ingredients. It's at the core of who we are, and we embrace it. We're cracking fresh, cage-free eggs for breakfast, lunch and dinner. All of our pizzas look different because they were made by hand. Our ovens are always roasting the delicious meats and vegetables served as entrees. Our freezers are really quite small. That's because we only use USDA-inspected, all natural, fresh and never-frozen ground beef. Milk doesn't travel well – that's why ours is delivered from local dairy farms. Our cheese comes from animals, not labs. Our fish and chicken tastes better because we bread each piece by hand. Potatoes, delivered fresh from the farm and in their original form, make the best mashed potatoes and fresh-cut French fries. All our food is trans-fat free, however, other fats may still apply. After all, we're chefs, not magicians! Real soup or sauce doesn't come from a can, jar or pouch. That's why ours taste so good. It's better for you, too! Our deli salads are fresher and healthier because we prepare all the ingredients ourselves. That means hand-shredding cabbage, dicing potatoes and chopping celery. Our freshly sliced deli meats build a better sandwich. Enjoy an exciting menu in a cozy, modern atmosphere with inside and outside seating, TV’s, and a fireplace. The Berg Bistro accepts cash, credit and student Berg Bucks. We keep it simple with artisanal sandwiches, salads, soups and gourmet flat breads. Top it off with a hand-spun milkshake or a delicious Crimson Cup coffee drink. The Bistro hosts the monthly Pints with Professors event, the weekly Coach’s radio broadcast, as well as trivia nights. Hoernemann Refectory is a trend setter. Heidelberg’s main dining hall is only the second Parkhurst dining facility and to have a full-blown Clean Plate Station, offering to students, the campus and the Tiffin community menu items that are gluten-free and do not include seven of the “big eight” food allergens. Learn more about catering options with Parkhurst Dining.